I am in the middle of planning just that thing out. I bought a new Yamaha YFZ450 radiator to use as the secondary rad. I am trying to figure out the best way to tap into the coolant system so that I don't have to modify much. Option 1 for that is putting the secondary radiator downstream of the oil cooler. Option 2 is to make a new cap for the thermostat housing that has a 2nd tap for the 2nd radiator. Yea.. I started a thread on that a while back.. I shipped my radiator to Krash so he can make me bolt on mounts to the cage I bought from him.. He's working on it.. once done.. I'm doing exactly what you posted. Weller KOH, Eibach Sway kit, TW 70/30/15 w clutch mod (self installed), Big Gun Full Exhaust w Graves Tune, Krash Cage, PRP 5 Pt, HESS 1.5:1, 30" Mongrels on front, Ironsides on rear w Sedona Beadlocks, Jagged Nerfs, FUTV 1/2" Full Skids, Weller brace and TEX frame Gussets, Lights, PowerBases XL-1200, Alba Intake Spacer and stacks, Homemade quick removable air pumper. How are you running the coolant lines? Are you T'ing into the main radiator lines or something different? Not really sure why you might need to do this mod, why not just do a relocate to the rear and be done with it. 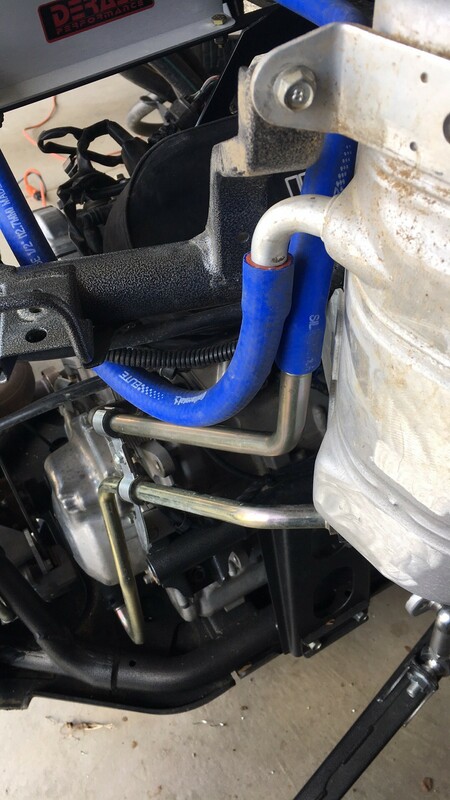 If you was dead set on the two rad system I would think the best route might be straight from your return hard pipe to aux rad, then from the aux rad to the thermostat housing, however you wouldn't want to restrict flow with a smaller rad neck fitting than the stock front rad, 7/8" or 1" not sure. I'm guessing you want to keep the radiator in the original location and lower coolant temps correct? 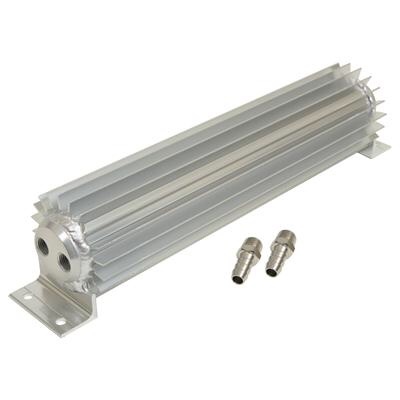 How about considering adding an oil cooler instead of secondary radiator. Reducing the oil temps helps to keep the coolant temps lower as the oil heat exchanger isn't adding as much heat into the coolant. It's a fairly common solution in short course cars to avoid having to install a larger radiator. After installing the oil cooler my coolant temps have dropped considerably during racing conditions. At my last event I didn't see any coolant temps over 190 degrees. This was a solid 20-25 degrees cooler than before installing the oil cooler. The kit I went with was purchased on Summit Racing's website. They have various options for line sizing, single or dual fans. This one is a AN 10 dual fan Derale. 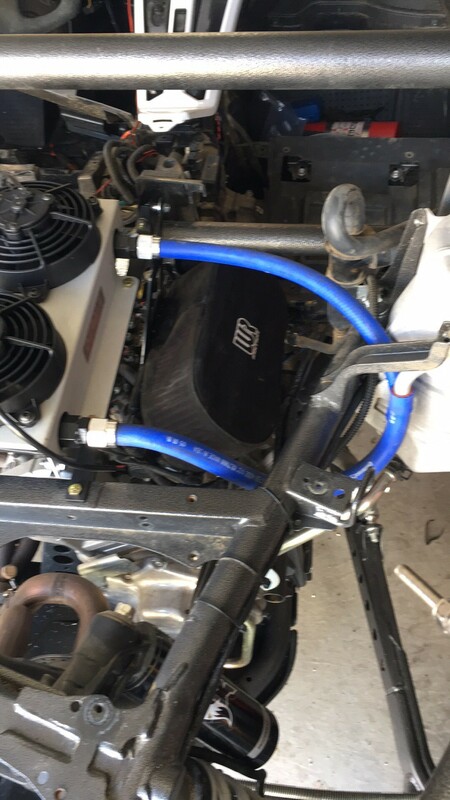 The attached photos were taken during my mock up, I did add hose clamps on both ends of the hoses. I've been thinking about this for quite a while and still have not settled on anything. I bought the YFZ-450 radiator a while back, but haven't dug in and installed it because I have some things to work out yet. The main reason that I want a radiator in the back is to prevent overheating when the front rad gets plugged with schmoo. This has only happened to me twice, but that is twice too many times. Both times were minor. Squirting a water bottle into the radiator allowed me to get back going. I still don't like it though. The smaller radiator should enable me to limp out of wherever I am no matter how plugged the front rad is. The reason that I don't want to do a front to back relocate is that the front rad will take up too much space if I put it in the back. Either I have to tilt it so that I can still see out the back (and lose more bed space) or I just have to live with no rear visibility. Also, the fans will have to run all of the time. No normal air flow. I want to keep coolant temp normal. My plan is to run both radiators in parallel, increasing the cooling capacity of the system by roughly 33%. The smaller back radiator will have it's own thermally switched fan and will take up little space. I can tuck it in so that I can still carry a nice tool box back there and still see out of the back. I do like the oil cooler idea, but have some misgivings about it cooling the oil too much when I do winter rides. I'll have to think on that. I was thinking of running a heat sink in-line. Would be easier to tuck away. Just havent had time to explore this option. Last edited by YxzCool; 04-14-2019 at 12:49 PM.